Why the rich escape sanction for sins far greater than those for which the poor are brutally stamped on. By our guest author, the late Adam Smith. "The profligacy of a man of fashion is looked upon with much less contempt and aversion, than that of a man of meaner condition. In the latter, a single transgression of the rules of temperance and propriety, is commonly more resented, than the constant and avowed contempt of them ever is in the former." 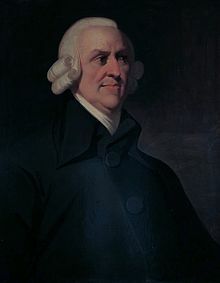 Adam Smith (1723-1790), free market capitalist icon. From financial scandals to tax evasion to child abuse we have seen how villains are dealt with according to their stations in life. Benefits cheats pinching welfare are publicly stamped on while bankers are treated with extreme lenience for £billions of frauds. Small traders cheating on their VAT returns make it onto HMRC's "most wanted" name and shame list, while the big tax dodgers get sweetheart deals over lunch. Norman Tebbit, once a leading establishment figure, said of the cover-ups of child abuse by showbiz stars, priests and politicians: "at that time most people felt the establishment was to be protected". "At that time"? It was thus for hundreds of years before "that time", and it continues to be thus. This disposition to admire, and almost to worship, the rich and the powerful, and to despise, or, at least, to neglect persons of poor and mean condition,..is, at the same time, the great and most universal cause of the corruption of our moral sentiments. That wealth and greatness are often regarded with the respect and admiration which are due only to wisdom and virtue; and that the contempt, of which vice and folly are the only proper objects, is often most unjustly bestowed upon poverty and weakness, has been the complaint of moralists in all ages. We frequently see the respectful attentions of the world more strongly directed towards the rich and the great, than towards the wise and the virtuous. We see frequently the vices and follies of the powerful much less despised than the poverty and weakness of the innocent. The respect which we feel for wisdom and virtue is, no doubt, different from that which we conceive for wealth and greatness...but, in the general air of the countenance, they seem to be so very nearly the same, that inattentive observers are very apt to mistake the one for the other. It is from our disposition to admire, and consequently to imitate, the rich and the great, that they are enabled to set, or to lead what is called the fashion....Even their vices and follies are fashionable; and the greater part of men are proud to imitate and resemble them in the very qualities which dishonour and degrade them. In many governments the candidates for the highest stations are above the law; and, if they can attain the object of their ambition, they have no fear of being called to account for the means by which they acquired it. Smith ends his essay stating the holders of ill-gotten greatness ultimately know what they are, and fear they will be ultimately caught out. Only they know whether this is true or not. the remembrance of what he has done; that remembrance never fails to pursue him. He invokes in vain the dark and dismal powers of forgetfulness and oblivion. He remembers himself what he has done, and that remembrance tells him that other people must likewise remember it. Amidst all the gaudy pomp of the most ostentatious greatness; amidst the venal and vile adulation of the great and of the learned; amidst the more innocent, though more foolish, acclamations of the common people; amidst all the pride of conquest and the triumph of successful war, he is still secretly pursued by the avenging furies of shame and remorse; and, while glory seems to surround him on all sides, he himself, in his own imagination, sees black and foul infamy fast pursuing him, and every moment ready to overtake him from behind. The respect which we feel for wisdom and virtue is, no doubt, different from that which we conceive for wealth and greatness; and it requires no very nice discernment to distinguish the difference. But, notwithstanding this difference, those sentiments bear a very considerable resemblance to one another. In some particular features they are, no doubt, different, but, in the general air of the countenance, they seem to be so very nearly the same, that inattentive observers are very apt to mistake the one for the other. In equal degrees of merit there is scarce any man who does not respect more the rich and the great, than the poor and the humble. With most men the presumption and vanity of the former are much more admired, than the real and solid merit of the latter. It is scarce agreeable to good morals, or even to good language, perhaps, to say, that mere wealth and greatness, abstracted from merit and virtue, deserve our respect. We must acknowledge, however, that they almost constantly obtain it; and that they may, therefore, be considered as, in some respects, the natural objects of it. Those exalted stations may, no doubt, be completely degraded by vice and folly. But the vice and folly must be very great, before they can operate this complete degradation. The profligacy of a man of fashion is looked upon with much less contempt and aversion, than that of a man of meaner condition. In the latter, a single transgression of the rules of temperance and propriety, is commonly more resented, than the constant and avowed contempt of them ever is in the former. In the middling and inferior stations of life, the road to virtue and that to fortune, to such fortune, at least, as men in such stations can reasonably expect to acquire, are, happily in most cases, very nearly the same. In all the middling and inferior professions, real and solid professional abilities, joined to prudent, just, firm, and temperate conduct, can very seldom fail of success. Abilities will even sometimes prevail where the conduct is by no means correct. Either habitual imprudence, however, or injustice, or weakness, or profligacy, will always cloud, and sometimes depress altogether, the most splendid professional abilities. Men in the inferior and middling stations of life, besides, can never be great enough to be above the law, which must generally overawe them into some sort of respect for, at least, the more important rules of justice. The success of such people, too, almost always depends upon the favour and good opinion of their neighbours and equals; and without a tolerably regular conduct these can very seldom be obtained. The good old proverb, therefore, That honesty is the best policy, holds, in such situations, almost always perfectly true. In such situations, therefore, we may generally expect a considerable degree of virtue; and, fortunately for the good morals of society, these are the situations of by far the greater part of mankind. It is from our disposition to admire, and consequently to imitate, the rich and the great, that they are enabled to set, or to lead what is called the fashion. Their dress is the fashionable dress; the language of their conversation, the fashionable style; their air and deportment, the fashionable behaviour. Even their vices and follies are fashionable; and the greater part of men are proud to imitate and resemble them in the very qualities which dishonour and degrade them. Vain men often give themselves airs of a fashionable profligacy, which, in their hearts, they do not approve of, and of which, perhaps, they are really not guilty. They desire to be praised for what they themselves do not think praise-worthy, and are ashamed of unfashionable virtues which they sometimes practise in secret, and for which they have secretly some degree of real veneration. There are hypocrites of wealth and greatness, as well as of religion and virtue; and a vain man is as apt to pretend to be what he is not, in the one way, as a cunning man is in the other. He assumes the equipage and splendid way of living of his superiors, without considering that whatever may be praise-worthy in any of these, derives its whole merit and propriety from its suitableness to that situation and fortune which both require and can easily support the expence. Many a poor man places his glory in being thought rich, without considering that the duties (if one may call such follies by so very venerable a name) which that reputation imposes upon him, must soon reduce him to beggary, and render his situation still more unlike that of those whom he admires and imitates, than it had been originally. To attain to this envied situation, the candidates for fortune too frequently abandon the paths of virtue; for unhappily, the road which leads to the one, and that which leads to the other, lie sometimes in very opposite directions. But the ambitious man flatters himself that, in the splendid situation to which he advances, he will have so many means of commanding the respect and admiration of mankind, and will be enabled to act with such superior propriety and grace, that the lustre of his future conduct will entirely cover, or efface, the foulness of the steps by which he arrived at that elevation. In many governments the candidates for the highest stations are above the law; and, if they can attain the object of their ambition, they have no fear of being called to account for the means by which they acquired it. They often endeavour, therefore, not only by fraud and falsehood, the ordinary and vulgar arts of intrigue and cabal; but sometimes by the perpetration of the most enormous crimes, by murder and assassination, by rebellion and civil war, to supplant and destroy those who oppose or stand in the way of their greatness. They more frequently miscarry than succeed; and commonly gain nothing but the disgraceful punishment which is due to their crimes. But, though they should be so lucky as to attain that wished-for greatness, they are always most miserably disappointed in the happiness which they expect to enjoy in it. It is not ease or pleasure, but always honour, of one kind or another, though frequently an honour very ill understood, that the ambitious man really pursues. But the honour of his exalted station appears, both in his own eyes and in those of other people, polluted and defiled by the baseness of the means through which he rose to it. Though by the profusion of every liberal expence; though by excessive indulgence in every profligate pleasure, the wretched, but usual, resource of ruined characters; though by the hurry of public business, or by the prouder and more dazzling tumult of war, he may endeavour to efface, both from his own memory and from that of other people, the remembrance of what he has done; that remembrance never fails to pursue him. He invokes in vain the dark and dismal powers of forgetfulness and oblivion. He remembers himself what he has done, and that remembrance tells him that other people must likewise remember it. Amidst all the gaudy pomp of the most ostentatious greatness; amidst the venal and vile adulation of the great and of the learned; amidst the more innocent, though more foolish, acclamations of the common people; amidst all the pride of conquest and the triumph of successful war, he is still secretly pursued by the avenging furies of shame and remorse; and, while glory seems to surround him on all sides, he himself, in his own imagination, sees black and foul infamy fast pursuing him, and every moment ready to overtake him from behind. Even the great Caesar, though he had the magnanimity to dismiss his guards, could not dismiss his suspicions. The remembrance of Pharsalia still haunted and pursued him. When, at the request of the senate, he had the generosity to pardon Marcellus, he told that assembly, that he was not unaware of the designs which were carrying on against his life; but that, as he had lived long enough both for nature and for glory, he was contented to die, and therefore despised all conspiracies. He had, perhaps, lived long enough for nature. But the man who felt himself the object of such deadly resentment, from those whose favour he wished to gain, and whom he still wished to consider as his friends, had certainly lived too long for real glory; or for all the happiness which he could ever hope to enjoy in the love and esteem of his equals." My life experience leads me to conclude IMMATURITY is modern man's downfall. Cleverness is prized way above wisdom and we have sacrificed infancy, childhood and natural development to SCHOOLING which perniciously arrests maturity. Those born today are doomed to die ever more immature than their forebears. Sadly, as with the 'boiling frogs' analogy, to the nihilistic mass - ALL IS WELL. Agreed - sad to say. One must wonder if good Mr. Smith, through his elaborate essay, had some unconscionable memories of his own, which had prompted such deep reflections and/or outward observations. Nevertheless about how this pointed article came to be, it's certainly SPOT ON. And the schools just simply indoctrinate. A very recent theoretical study proves that students (of varying ages and grades, 6-college) were generally widely unable to discern so-called "fake news" from actual news. They lack critical thinking capacities. Excellent post and informative. Pro-capitalist Yankees who claim to worship Adam Smith don't seem to have read him as they idolise wealth and demean the poor which is a reason why the modern USA is a morally bankrupt nation and a cancer on this planet. It is also interesting reading Smith's comments about Negligence and Profusion by hired managers of Joint Stock. Sorry, I don't have the quote handy. Google doesn't quite deliver either. What Smith, Mill and Bentham said as they laid the philosophical foundation of the modern market economy and modern apologists for capitalism (not the same thing as a market economy) think they said can be rather far apart. Bentham argued strongly against the poor having to depend on private charity for example. They would have taken Ayn Rand to pieces.